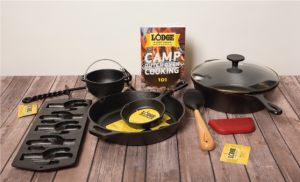 Lodge Cast Iron, BBQ Sauce & Tree Banding & More! When Joseph Lodge began making cast iron in 1896, he began a legacy that would create the foundation to an enduring standard of quality carried forward by four generations of family management. Renfrow’s carries a full range of American-Made Lodge products. These make fantastic Christmas, birthday, and wedding gifts that are sure to please cooks of all skill levels. Tree Tanglefoot Insect Barrier is a sticky, caramel colored paste made from natural gum resins, vegetable oil and wax. When applied as a continuous band around the trunks of shade trees, fruit trees, plants or vines, it creates a barrier that effectively entraps or repels destructive climbing insects. There is a regional problem with “cankerworms,” an inchworm that hatches up in the top of deciduous trees in early spring when they are putting out new leaves for the year. The cankerworms devour the leaves, which makes the trees have to put out new leaves again, which severely weakens them and uses up their energy reserves if it happens several years consecutively, which may end up killing the trees. 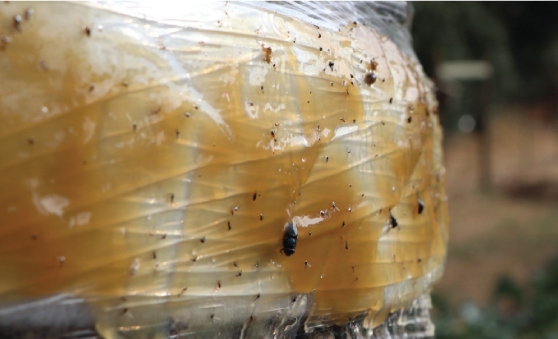 The cankerworms hatch out of eggs laid by female wingless moths that climb up trees in the wintertime after severe cold – apply Tanglefoot bands and you will capture and prevent them from getting the chance to lay eggs and thus decrease the population and infestation for the spring! The combination of ingredients is non-toxic to insects, humans, pets and the environment. Tree Tanglefoot works strictly in a mechanical fashion. It is listed by the Organic Material Review Institute (OMRI) for use in organic gardening. Tanglefoot for tree banding is available at Renfrow Hardware in the autumn for the ideal banding timeframe of November 1st – December 31st. We carry three container sizes: 15 ounces, 5 pounds and 15 pounds. We also carry all of the other necessary supplies – shrink-wrap, insulation, putty knives and gorilla tape. Check out our informational video starring the Renfrow crewmember, Ted Caudle the “Plant Doctor”, on how to protect your trees from the cankerworm infestation through banding and applying Tanglefoot. The Town of Matthews is strongly encouraging citizens to proactively band so the infestation does not get out of control. For best results, attempt to get your bands up around Thanksgiving, after the leaves have all fallen from the trees. Our Renfrow Farms Honey is the most popular item on our “local product” shelf, from our farm 3 blocks up the street in downtown Matthews. Learn more about our four harvest seasons of the sweetest honey around. Boist Grist Mill in Cabbarrus County, NC grinds delicious white and yellow grits and cornmeal, all made with non-GMO corn. Marguerite’s BBQ sauce is made one town over, in Mint Hill. Marguerite’s is sure to please, regardless of whether you prefer your BBQ sauce ‘hot’ or ‘mild’ – we stock both options! Crafted in Charlotte with fresh ingredients. We stock their four types – Marinara , Mushroom Marinara, Vodka and a spicy Arrabbiata sauce. Grammie’s Salsa is made in the neighboring town of Mint Hill. Our farm beekeeper’s own line of Charlotte-area honey, and we carry his jars that have the sweet treat of honeycomb tucked inside! Many of these items are very popular and we occasionally run out of some items (though we never run out of honey!) so if you have a particular need, please call ahead and ensure its availability.